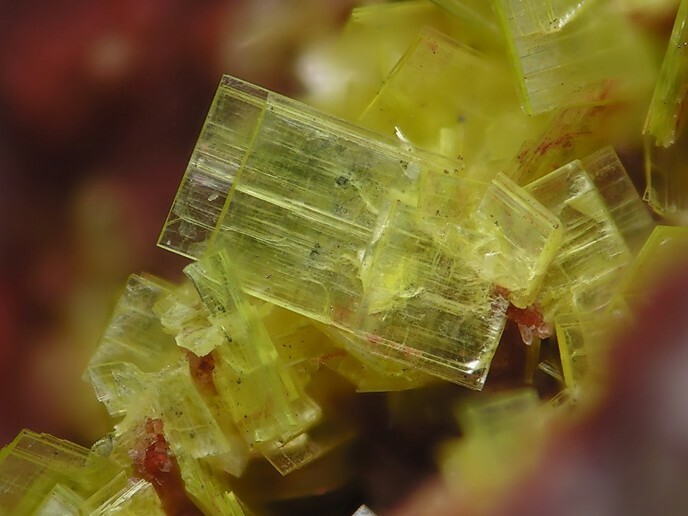 Heinrichite: Mineral information, data and localities. For mineralogist Eberhardt William Heinrich (1918-1991), University of Michigan. Unstable at room temperature and dehydrates fairly rapidly to metaheinrichite (Walenta, 1965) which may be fully transparent. Most of the specimens shown on the photos here are probably metaheinrichite. SG P2/c. Data for synthetic material. Pseudotetragonal lattice. Uranocircite Ba(UO2)2(PO4)2 · 10H2O Tet. Abernathyite 9 photos of Heinrichite associated with Abernathyite on mindat.org. Metaheinrichite 3 photos of Heinrichite associated with Metaheinrichite on mindat.org. Erythrite 2 photos of Heinrichite associated with Erythrite on mindat.org. Zeunerite 1 photo of Heinrichite associated with Zeunerite on mindat.org. Cuprite 1 photo of Heinrichite associated with Cuprite on mindat.org. 8.EB.05 Uranocircite Ba(UO2)2(PO4)2 · 10H2O Tet. 8.EB.05 Xiangjiangite (Fe3+,Al)(UO2)4(PO4)2(SO4)2(OH) · 22H2O Tet. 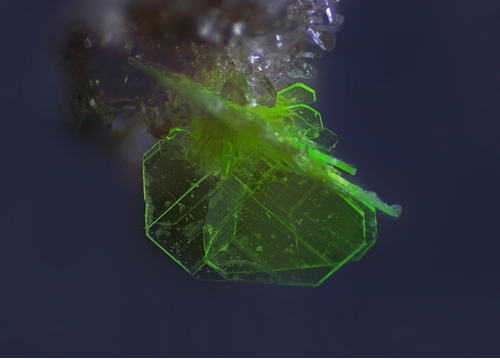 8.EB.10 Lehnerite Mn2+(UO2)2(PO4)2 · 8H2O Mon. 8.EB.10 Przhevalskite Pb2(UO2)3(PO4)2(OH)4 · 3H2O Orth. 8.EB.15 Chernikovite (H3O)2(UO2)2(PO4)2 · 6H2O Tet. 8.EB.15 Uramphite (NH4)2(UO2)2(PO4)2 · 6H2O Tet. 8.EB.20 Threadgoldite Al(UO2)2(PO4)2(OH) · 8H2O Mon. 8.EB.20 Chistyakovaite Al(UO2)2(AsO4)2(F,OH) · 6.5H2O Mon. 8.EB.30 Vochtenite (Fe2+,Mg)Fe3+(UO2)4(PO4)4(OH) · 12-13H2O Mon. 8.EB.35 Coconinoite Fe3+2Al2(UO2)2(PO4)4(SO4)(OH)2 · 20H2O Mon. 8.EB.40 Ranunculite HAl(UO2)(PO4)(OH)3 · 4H2O Mon. 8.EB.45 Triangulite Al3(UO2)4(PO4)4(OH)5 · 5H2O Tric. 20.7.8 Arsenuranylite Ca(UO2)4(AsO4)2(OH)4 · 6H2O Orth. 20.7.13 Metalodèvite Zn(UO2)2(AsO4)2 · 10H2O Tet. 20.7.16 Hügelite Pb2(UO2)3(AsO4)2O2 · 5H2O Mon. Gross, E. B., Corey, A. S., Mitchell, R. S., Walenta, K. (1958): Heinrichite and metaheinrichite, hydrated barium uranyl arsenate minerals. American Mineralogist 43, 1134-1143. Walenta, K. (1965): Beiträge zur Kenntnis seltener Arsenatminerale unter besonderer Berücksichtigung von Vorkommen des Schwarzwalds. 2. Folge. Tschermaks Mineralogische und Petrographische Mitteilungen, 9, 252-282 (in German). Le Règne Minéral, (33), 5-25. [Le Règne Minéral 1997, 13, p.5-18]; Dal Bo, F., Hatert, F., & Philippo, S. (2018). Supergene Uranyl Mineralization of the Rabejac Deposit, Lodève, France. 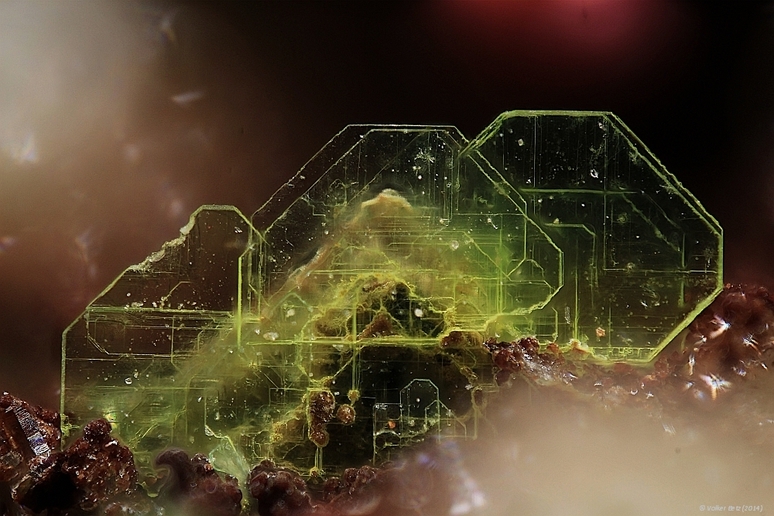 Minerals, 8(9), 414.
ⓘ Müllenbach U deposit ? Wendel, W. & Rieck, B. (1999c): Lavrion: Die komplette Mineralliste. Lapis, 24 (7-8), 61-63.
ⓘ Mine No. 18 ? Simon, P. & Kapellas, K. (2017): Uranmineralien und rote Barytkristalle: Erstfund von Sklodowskit in Lavrion, Griechenland. Lapis, 42 (7-8), 58-65.